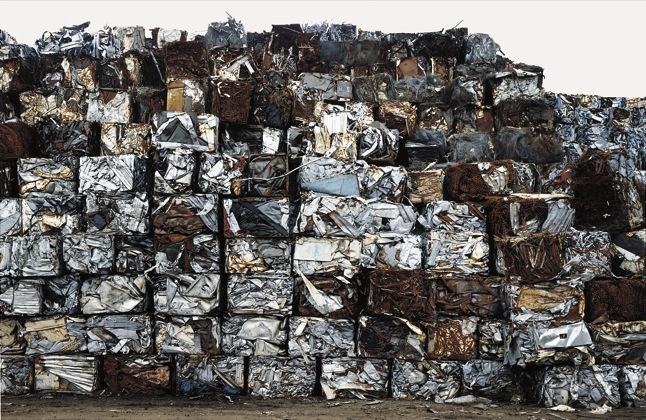 Scrap metal was America’s second most valuable export last year, thanks to rapid growth in China and India, where it is mostly used in construction materials. In a sense, China’s industrial might is being created out of the ruins of our own. Photograph by Robert Polidori. Here’s the scoop on old cars…”The ARA is a national trade group for salvage yards, used parts dealers and scrap processors. Wilson says there are about 8,400 United States auto recycling businesses, generating about $23 billion worth each year.” . . .
“An engine and transmission from a single car can be worth hundreds or thousands of dollars. Smaller parts, such as catalytic converters, can be worth up to $250 each due to the platinum used in the converter. About 32 percent of vehicles sold at salvage auctions today are purchased by foreign buyers, according to Horn. “I’d say five years ago, the number was about half that,” he said. Overseas salvage vehicle buyers come from China, Africa and the Middle East. But the biggest player is Mexico. Since 2005, at least 3 million cars have been exported to Mexico, according to Lucas Davis, a University of California business paper who has studied the salvage car market. “At the peak it was a million a year,” Davis says. The Mexican exodus began in 2005 when export rules were eased. “It was like you turned on a faucet,” Davis said. “Massive amounts of cars were flowing.” In 2008, the Mexican government tightened its rules and the flow eased. “You still see cars going south but not in as large a volume as in 2005, 2006 and 2007,” Davis said. Most cars going to Mexico would have been scrapped in the United States, Davis said. In Mexico, they are being kept on the road, which is good for Mexican drivers, because they are much less costly than new cars. But it’s not for United States auto recyclers. “There’s no question that they are a loser here,” Davis said. So, I learned how big the auto-recycling industry really is and how competing interests make it politically relevant. But that was nothing compared to what else I uncovered as I sifted through the results of another google search – this time following a lead that explained the details of the “cash for clunkers” program and its failure to achieve its stated goals of helping the auto-industry and improving the environment. It did however, create a lot of junk for the auto-recycling industry! The scrap dealer has a vested interest in a uniquely unsentimental outlook on human endeavor. The destruction of the World Trade Center freed up more than a hundred thousand tons of high-grade inventory, much of it handled by Metal Management. Hurricane Katrina was a similar bonanza for some Southern scrap dealers. The collapse of Saddam Hussein’s Army and infrastructure in Iraq produced a great deal of scrap, and thanks to a scrap-export ban imposed by the Iraqi government, in 2004, most of the metal remains in the country; it is the raw material for Iraq’s future steel industry. Unfortunately, looters tore up most of Iraq’s existing steel mills and sold them for scrap, so they’ll have to be rebuilt first. In the early nineteen-nineties, a wave of consolidation swept through the garbage business. Small garbage carters were acquired by several big companies, the largest of which was Waste Management. These companies had the resources to do long-distance garbage transportation, which became important for cities like New York, where the last local landfill, at Fresh Kills, on Staten Island, closed in 2001. By the end of the decade, the garbage business had been successfully consolidated, and the industry was looking for new ways to grow. To some investors, the obvious next move was the scrap-metal business. In the middle to late nineties, Metal Management was put together by some executives from the waste industry, who were backed by private-equity firms. By leveraging the value of the scrap in its yards, Metal Management borrowed money and expanded, but its timing was terrible: beginning in the summer of 1997, a financial crisis gripped a large part of Asia, and the value of metals plummeted. Metal Management couldn’t meet its debt payments, and the company went bankrupt. As Dan Dienst explained the company’s problems to me, “The garbage guys said, ‘They have scrap, we have waste. They use trucks, we use trucks. They have scrapyards, we have transfer stations. They take it to a steel mill, we take it to a landfill—it’s the same thing.’ But it was a flawed analogy. The big difference was that their business was based on fees from people whose garbage they were picking up. It was a dependable cash flow that you can borrow money against reliably. But in the scrap business the capital is your metal in the yard, and that’s a commodity, which means the value can change.” Indeed, the scrap business is a commodity founded on other commodities—the price of steel, the cost of shipping, and the relative values of currencies—which makes scrap especially sensitive to changes in the national and global economy. Alan Greenspan, the former chairman of the Federal Reserve, once said that he didn’t need to study a lot of economic indicators to sense where the economy was headed; he needed only to look at scrap-metal prices. So, now we see where the world’s old cars go to die – through vertical integration, thanks to the gutting of Glass Steagall – full circle, right back into the hands of the money changers who brought them to life to begin with. Next Higher-Ed for Free! Germany did it, so did Tennessee!